We aggregate and unify the data spread across multiple sources such as NCBI, UniProt, KEGG, and make it easily accessible at one spot. BioSeek indexes a large variety of entities- diseases, genes, drugs, pathways, and guides you through selecting the best hit by delivering dynamic suggestions in a structured, faceted list. The intelligent suggest makes it easy to identify the exact entity you are searching for in the dynamic drop list which appears while you type. Thanks to the graph database we have built and the semantic analysis which is continuously performed, all articles which talk about the entity you search are stacked together and delivered to you, regardless of the specific designation mentioned in the article text. Machine learning is helping us deliver the most accurate results. We are taking digital tools for scientific research to a new chapter: simple, smart and graceful user interface utilizing drag&drop and infinite scroll, a rich set of functionalities, and an agile help system, bring into being a 21st century look and feel to an online platform for scientific research. We don’t simply unify data from multiple sources, we also analyse and present it visually with customizable filters. Visualizes most popular entities mentioned in one article with the entity being searched. Visualizes the mentions and co-mentions of entities, forming clusters where entities are co-mentioned often. The clusters are signs of existing or emerging theories. Performs searches for articles which mention each possible pair of entities from your original search. Shows popularity tendencies of entities within given group in time. Number of mentions of given entity in time. Shows number of mentions of given entity in articles for each year. BioSeek Reader enables you to get additional information on any Bio term mentioned in your .pdf, .docx, .xml, .html, etc. files in less than a second. It recognises more than 60 million genes, proteins, diseases, organisms, processes, authors, etc. we will present the information with a simple CLICK. BioSeek Browser Extension enables you to get additional information on any Bio term mentioned in an article from NCBI’s Pubmed database, Nature Journal and FEBS Press. We are continuously integrating the most relevant web sources in the field.The algorithm recognises more than 60 million genes, proteins, diseases, organisms, processes, authors, etc. BioSeek Outlook Add-in enables you to get additional information on any Bio term mentioned in your emails in less than a second. It recognises more than 60 million genes, proteins, diseases, organisms, processes, authors, etc. Exploration search has a new friend! The Mind Map is a visualization tool which helps you structure and develop your idea. The Visual Search allows you to run multicomponent searches while specifying the class of each searched entity. You have the data in graph structure. It is best to structure your search as a graph too. Deep integration with all other components of the platform. The semantic algorithm which converts terms into interactive entities (tags) allowing for further navigation, operates within messages, making the information they contain easily accessible. Recognizes links from other websites and converts them into interactive entities – shareable, clickable, drag-droppable tags. Mathematical formulas and chemical reactions are also drag-droppable and interactive. BioSeek makes sure you receive your important updates on schedule. You don’t need to perform repetitive searches. You will be automatically notified about updates on your items of interest. BioSeek allows you to make annotations on your PDF files, online sites or emails, keep and organize them directly in the BioSeek cloud just by selecting text. BioSeek delivers various stats at the Insights section to give you a clear overview of your activity: searches and viewed items count and percentages, sent messages, etc. We believe that relevant information should find you and not the other way around. Based on your actions and professional profile, BioSeek’s machine learning algorithm intelligently creates a selection of relevant articles at the Insights Newsfeed section. Social Relationships and Health Behavior Across Life Course. I am impressed with BioSeek’s achievement. Their search engine is so powerful that digging through all relevant databases takes only a few seconds and at the end unifies the appropriate information for genes, diseases, pathways, drugs, organisms and authors. Moreover, the built in advanced tools allow developing the search into a new research idea and even share and discuss it with fellow researchers. I strongly recommend it to anyone who is looking to ease and speed up the research process. 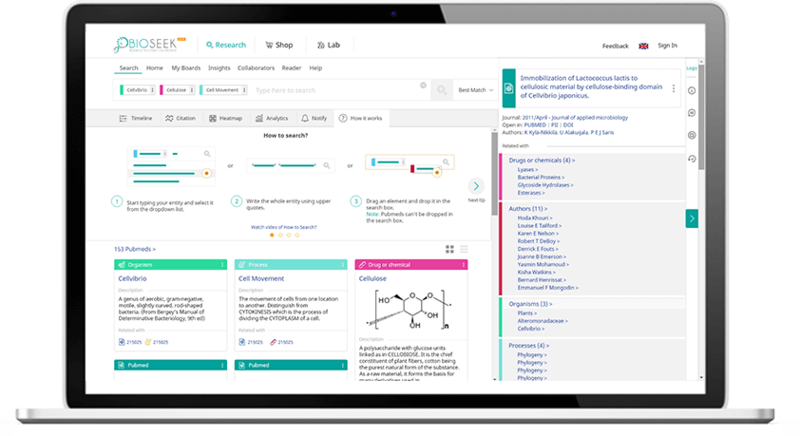 BioSeek provides unprecedented flexibility and tractability of the searches and miraculously combines various inputs such as PubMed entries, gene identities, chemicals, and KEGG pathways, to guide you towards a comprehensive network of published material within your field! What a brilliant idea! BioSeek is a highly convenient program, developed with the help of science workers. It covers the necessities of anyone involved in the science area. It includes unexpected to me functions that support me in achieving optimum efficiency in my work. Our specialists will be happy to give you a quick personal demo and answer any questions you might have! The algorithmic foundation of BioSeek can be applied to all internal documentation, teams, etc. Our solution is applicable in domains like Fintech, Real Estate, Insurance, etc. Ridacom is responsible for supply, logistics, and customer support. Ridacom is a leading supplier in the field of laboratory diagnostic, bioscience, chemistry and biomedical science. Ridacom is a trusted provider with more than 13 years of experience and more than 6000 happy customers. An ISO certified supplier, Ridacom guarantees the highest quality of products, storage and transportation under optimal conditions.